Hampton Green is a 19-storey reinforced concrete high-rise condominium building. 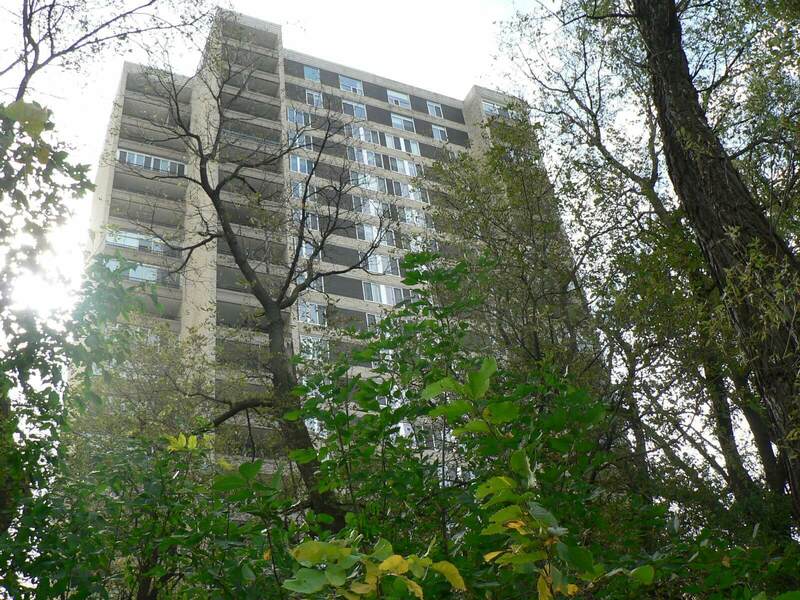 The building was constructed in 1969 and converted to condominium status in 1979. The property is constructed of a reinforced concrete frame, with concrete block, faced with limestone. The building consists of 103 units plus underground parking for 168 cars. Parking facilities are provided for the occupants in a three-level parking garage beneath and adjoining the main building. Locker storage is provided for the unit. In addition to the vertical sound suppression qualities of the solid concrete construction, dividing walls between units have been engineered to virtually eliminate sound transmission. Each of the nineteen floors within the subject improvement has been calculated to have an area of approximately 11,000 square feet. A typical floor consists of six units plus the common corridors, a laundry room, garbage disposal chute and two stairwells for emergency exits. The main floor consists of a vestibule area where front door personnel controls the entrance doors and can page each of the individual units, a lobby area and entrance to a lounge which is tastefully decorated overlooking the front approach to the complex; the elevator lobby, women’s and men’s sauna rooms, freezer room, superintendent’s unit, refuse room and commissariat. ONLY FOUR/SIX UNITS PER FLOOR: This unique plan assures you of maximum privacy and quiet – with near-instantaneous elevator service. The corridors are short and carpeted. YEAR-ROUND CLIMATE CONTROL: Quiet, clean systems for heating and cooling are built in. Your unit has its own individual thermostatic controls to put the desired temperature at your fingertips. Corridors will be cooled and pressurized, to control hallway odors. SOUND SUPPRESSION SYSTEM: In addition to the vertical sound suppression qualities of solid concrete construction, the dividing walls between units have been engineered to virtually eliminate sound transmission. ENTRANCE WAY: A door of solid selected hardwood, fitted with elegant hardware. Across the threshold, guests step into a foyer large enough to be an appropriately magnificent introduction to your home. KITCHEN: As comfortable as it is convenient. There is ample room for informal dining and just steps away, all the luxurious features of a completely equipped working area. CLOSETS: Thoughtfully placed throughout the units, each designed for maximum utility and convenience. Linen closet, huge wardrobes and walk-in storage. STORAGE: Within the service area of the building a private bulk storage locker is supplied for each unit. SPECIAL FEATURES IN ALL UNITS: Ceiling heights in all units are 8’9”, providing spaciousness and excellent air circulation. ROOM-SIZE PATIO TERRACE: Outside every unit is your own private terrace; for entertaining or just relaxing. COMMUNICATION SYSTEMS: For your convenience, the service will connect directly to front door personnel. PARCEL ROOM: On the premises, receiving room to provide safekeeping for packages delivered in your absence. COMMISSARIAT: Is located on the main floor. LOBBY AND PORTE COCHERE: A permanent canopy provides protected access to and from your car or taxicab. The lobby itself is elegantly appointed and completely air conditioned. FRONT DOOR PERSONNEL: Twenty-four hours a day, front door personnel are on duty to assist you. CAR SERVICE: A valet will be on hand to pick up and deliver your car to and from the Port Cochere or the protected underground garage twenty-four hours a day. Supervised guest parking is an added convenience. ROUND-THE-CLOCK PROFESSIONAL MAINTENANCE STAFF: All building maintenance is taken care of for you – twenty-four hours a day. SITE SUPERINTENDENT: A resident superintendent provides assistance with in-unit questions and general building operations. LOCATION AND GROUNDS: The prestigious location of Hampton Green affords you an in-town home in a beautifully landscaped park-like setting. The terraced half-acre plaza approach to this building is artistically appointed with trees, shrubs and flowers. Reflecting pools add a touch of glamour and beauty.